The second annual Paint Staunton Quick Draw Art Competition and Wet Paint Sale promises fun for professional artists, amateur artists, budding young artists and collectors of original art. Area plein air artists will compete for $875 in cash prizes. The public is invited to come watch artists of all ages capture the timeless beauty of downtown Staunton and purchase the art during the wet paint sale. The paint competition begins at 9:30 am at the Sunspots Pavilion in downtown Staunton on Saturday, April 29. Judging will take place at the Sunspots Pavilion at 12:30 pm and prizes awarded at 1:30 pm. Rosealie Day White, a BSSS co-founder, and esteemed plein air painter will serve as juror. The Wet Paint Sale begins at 2:00 pm. Registration for professional and amateur artists is $15. Artists 16 and under participate for free. 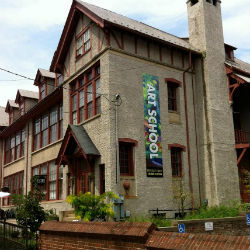 For more information regarding the Paint Staunton Quick Draw Art Competition and Wet Paint Sale, visit www.bssschool.org. Paint Staunton Quick Draw Art Competition and Wet Paint Sale is an event of the Beverly Street Studio School (BSSS) whose mission is to provide the community and region with a variety of opportunities to explore the world of the visual arts through practice, professional instruction, and contact with practicing artists. BSSS is a non-profit organization and is proud to be celebrating 25 years in 2017.